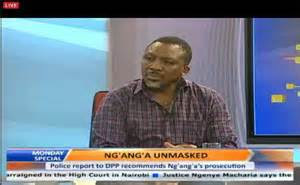 On Monday, Pastor James Nga'ng'a was interviewed by Citizen TV and he made over a million grammatical errors. I keenly listened to him as he tried to bite his tongue. Mind you, he is a millionaire, huh! How does he even preach? Gerrarahia men!!!!! 5. The person who was driving, I don't remember his name clear because he is a part of the member who is Mbugua! Waaaah! 8. You Journalism. You took photo of the day when I was happy in my wedding then you put photo of somebody who is died. Oh Lord! 9. You Journalism! You must come clear! And show the things how it is. 17. Can I ask you question? 20. You can read newspaper,they say I say this i say this,who has ask me question? 21. Because the car was among the hotel... I would go as a human... Ngai Fafa!